The reason Germany didn’t miss injured Michael Ballack in the World Cup can be summed up in two words: Sami Khedira. The young Stuttgart midfielder had an excellent tournament, and made many people’s Best XIs. He won’t be at Stuttgart much longer, however. His fine World Cup has earned him a move to Real Madrid. 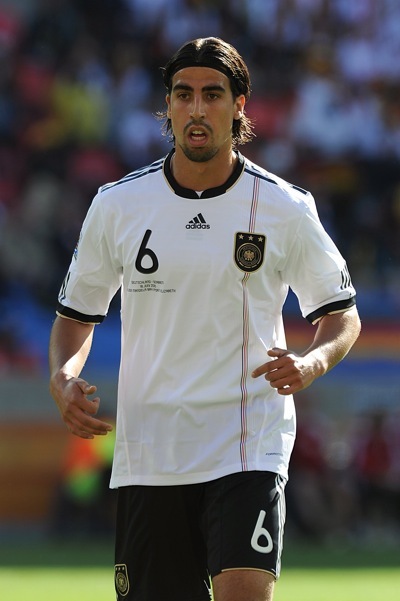 According to reports, Khedira is in Madrid right now, agreeing personal terms on a €10m move from VfB. The signing of Khedira almost certainly means Steven Gerrard is going nowhere this summer. It also means Lassana Diarra could be on his way out of the Bernabeu. Oh God, how they should rue there missed chance to sign the greatest england midfielder since Alan Ball! (Sarcasm for anyone not in on the joke). Real Madrid have done well here. Now for Thomas Muller. L. Diarra was awesome for a season and a half in Madrid. What happened to his form. I think Gago’s prospects won’t improve either. Most over-rated piece of crap since The Matrix II.